What Can I Do to Recover Deleted Contacts on iPhone Xs/Xs Max/XR? Home> Resource> iOS Recovery> How to Recover Deleted Contacts on iPhone Xs/Xs Max/XR? How to Recover Deleted Contacts on iPhone Xs/Xs Max/XR? In order to find the target contacts more quickly as well as speed up your iPhone Xs/Xs Max/XR, it is a good habit to remove some duplicate or useless numbers on your phone. But it is very possible that you omit the wrong contacts and lose some important phone numbers. This would be embarrassing. Thus, you may wonder if there is any solution to recover the deleted contacts on iPhone Xs, iPhone Xs Max and iPhone XR without asking others. - Recover data from iDevice directly without iTunes backup or restore data from iTunes backup easily. - Retrieve more than 10 types of files on your iDevice without limitation, including Contacts, Messages, Call history, Photos and so on. - Get back deleted, lost or formatted data easily and securely. 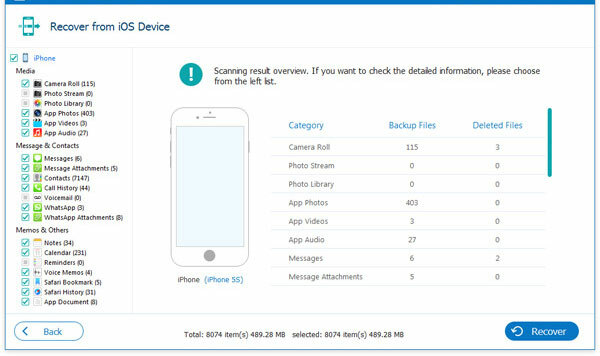 - Backup iOS data on computer. How to Restore Backups to iPhone Xs/Xs Max/XR? Amazing, right? So don't hesitate! Just click the icon below to download and install the tool on your computer so that you can find back your deleted contacts within few simple clicks. First of all, you need to use an USB cable to link your iPhone and the computer. After the connection, you can choose a mode- Recover from iOS Device or Recover from iTunes Backup File as you like. 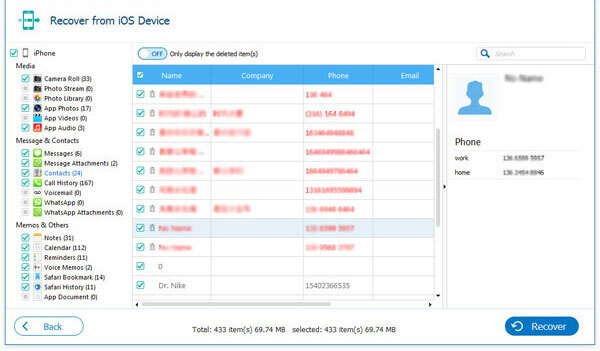 Attention: please jailbreak your phone if you want to recover the data from iPhone directly or the software will not be able to detect your device. If you do not know how to jailbreak your device, you can follow the instructions that are shown in the main interface. 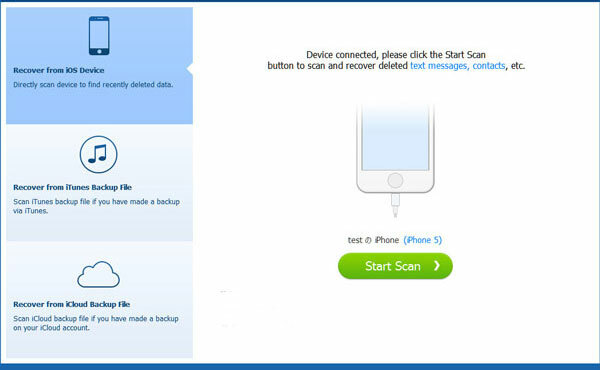 After recognizing the iPhone, the tool will auto-scan all data on your device and display them in categories. Click the "Contacts" folder in the left panel and then the corresponding contents will be displayed in the right panel. Notice: unregister users cannot check the whole contents of the data. So if you want to preview all details, you need to register the program firstly. Tick all the contacts that you want to restore, and then hit "Recover" button to get back and save them on your computer. How to Undelete Notes on iPhone Xs/Xs Max/XR/X/8/7? How to Recover Deleted GIF Photos from iPhone?